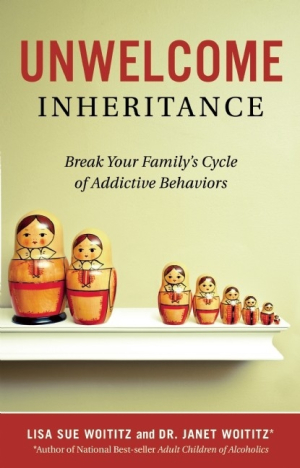 Woititz identifies the cycle of addiction inheritance from parents and provides solid methods of avoiding passing on destructive behaviors. Addiction has a ripple effect on families, and the late Janet Woititz was the first to formally identify the patterns in those ripples, in Adult Children of Alcoholics. Her daughter, Lisa Woititz, picks up the baton with Unwelcome Inheritance: Break Your Family’s Cycle of Addictive Behaviors, a look at how to prevent past troubles from tainting the present and future. First, she clearly explains how the cycle works. Adult children of alcoholics, or ACOAs, carry the genetic proclivity to addictive behavior. But even if they remain sober, Woititz writes, the emotional baggage of their youth can manifest in codependency, enabling, and other behavior learned in a household characterized by substance abuse. Woititz, a parent whose own father was an alcoholic, identifies the troubling characteristics of ACOAs as parents: they can be insecure and want to please everyone, they may have trouble recognizing normal behavior, they often expect dishonesty, and they can’t deal with a problem until it is a crisis. Second, she convincingly outlines a way out of the cycle by moving toward empathy and away from resentment. That entails looking at a loved one’s addiction through the lens of his or her own personal story. Woititz often evokes Alcohol Anonymous’s Serenity Prayer as a reminder to not be consumed with things that cannot be controlled. She also ends each of the eight chapters with a “Takeaway” that includes previously unpublished writing by her mother, who previously discovered that family members of alcoholics share certain cognitive hang-ups.